The Metropolitan Area of the Valley of Mexico, as Mexico City’s wider metropolitan area is locally known, faces a two-fold dilemma. In recent years, the intensity of rains has increased, straining drainage systems and causing severe flooding in low-lying areas. At the same time, the water supplies available for daily use has declined. Both problems are highly correlated with the effects of climate change, but they are also a consequence of urban sprawl and lack of long-term adaptation measures. The situation sheds light on the effects of climate change in large urban areas and both the opportunities and challenges facing cities around the world in the years ahead. 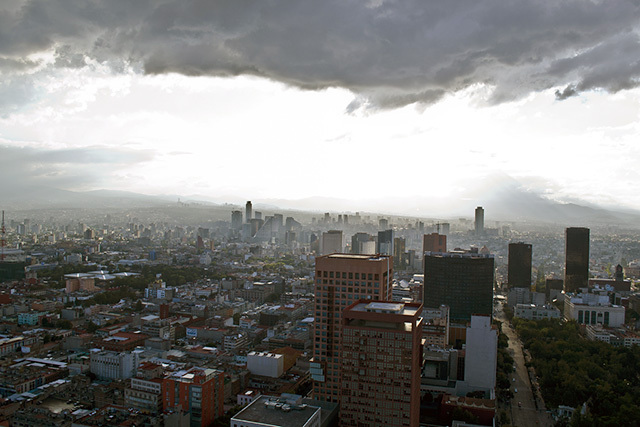 Changing precipitation patterns in Mexico’s capital have followed what scientists have predicted for elsewhere too: rainfall events are becoming more intense, yet shorter and scarcer. The World Meteorological Organization reports a steady increase in the intensity of rainfall for the Valley of Mexico since the beginning of the 20th century. On June 28 of this year, for example, 7.5 billion liters (1.9 billion gallons) of rainwater fell over the city in just a few hours. Additionally, the city is seeing higher temperatures. The frequency of heatwaves by decade has increased significantly since the end of the 19th century. By 2030, average temperatures during the coldest months are expected to increase by 1.25 degrees Celsius. The combination of these two trends puts the city at risk of serious flooding and an unprecedented water crisis. Hotter temperatures are increasing demand for water in a city where already nearly 20 percent of residents lack consistent, daily access. Drought is more likely thanks to more rapid evaporation in lakes, rivers and reservoirs. More intense but scarcer rains also disrupt the natural filtration process by which the city’s crucial underground aquifers recharge. Urban sprawl aggravates the looming threat. Extracting, transporting and pumping the water needed to provide basic services to the entire city is a great challenge in and of itself. The city imports about 37 percent of its water from remote sources and 35 percent is lost due to leaks and theft along thousands of kilometers of pipelines. The lack of compact urban development elevates the costs of transporting and pumping water to and from the city and makes it more likely large amounts will be lost along the way. Uncontained urban sprawl is also cutting into conservation lands, mostly located south of the city, and mountainous areas around the Valley of Mexico. Conservation lands provide highly valuable ecological services. They allow soils to properly filter water, absorb it and eventually recharge aquifers. Covering them in asphalt cuts off these processes and adds to the city’s drainage and sewage problems as more and dirtier water ends up in the system. Forest lands on the slopes of hills and mountains allow rainwater to runoff and recharge reservoirs and lakes. However, settlements along the Valley of Mexico’s rim, many of them informal, prevent the natural flow of water downhill and increase the amount of sediment in water bodies. Landslides and mudslides too are a major problem as communities creep onto more and more marginal land. Use every policy instrument to densify the city and stop sprawl. A more compact and connected urban area is one of the best ways to reduce pressure on the city’s drainage and water systems. Prioritize public transportation. The transport sector contributes 46 percent of total emissions in the Valley of Mexico in large part due to Mexico City. Expanding low-emission public transport should be at the forefront of urban development policies. Stop expansion into mountainous areas and restore and protect conservation lands. The water cycle is being obstructed by development that hampers proper runoff along mountain slopes and reduces soil absorption rates. Droughts and floods are more likely and aquifers are draining quickly. Improve existing climate adaptation plans. Innovative, new approaches will be needed to create a water model that will sustainably meet the city’s needs in the decades ahead. A growing population – 2 million more people by 2030 – and accelerating climate change will only add to problems. Potential solutions include rainwater collection systems that operate in parallel with the city’s drainage system to supply more freshwater. Similar ideas should be considered as part of the city’s climate plans. Megacities like Mexico City offer large windows of opportunity to shift our models of urban development towards more sustainable patterns. Major policy changes could have a large impact on more than just climate change adaptation and mitigation, providing benefits like better access to electricity, sanitation and housing. However, the room for maneuvering is decreasing. We must act now to contain the most harmful effects of climate change and ensure a healthier, safer more productive future for residents. Tomislav Lendo is Executive Director of the Human Sustainable Development Foundation. Ricardo Smith is a Policy Analyst at the Human Sustainable Development Foundation.